Inlaid Map of the US and British Virgin Islands in the cockpit table. Home-made scones by Dianne! A treat to wake up to! Growing up, Kelly had a sailboat which she sailed and raced for years. She spent many family vacations sailing in the British Virgin Islands since the late 1970′s. After working several years for a major electronics company, Kelly attended culinary school and after graduation worked as a baker and cook at a catering company, for 10 years in Portland, Oregon. After leaving the catering business, Kelly put her culinary education together with her computer skills and worked as a consultant, implementing systems and controls in restaurants. In 2012, she decided it was time for another change! She and Dianne formed the company, Time of Your Life Adventures and began providing sailing adventures in the Caribbean aboard their catamaran Mango. Dianne has worked in the culinary field since 1975. She graduated from Western Culinary Institute in 1989 and worked for The Red Lion Hotels. Dianne then spent the next 23 years as a Chef Instructor at Le Cordon Bleu Portland, receiving Chef of the Year twice and several Student Appreciation awards (student voted). 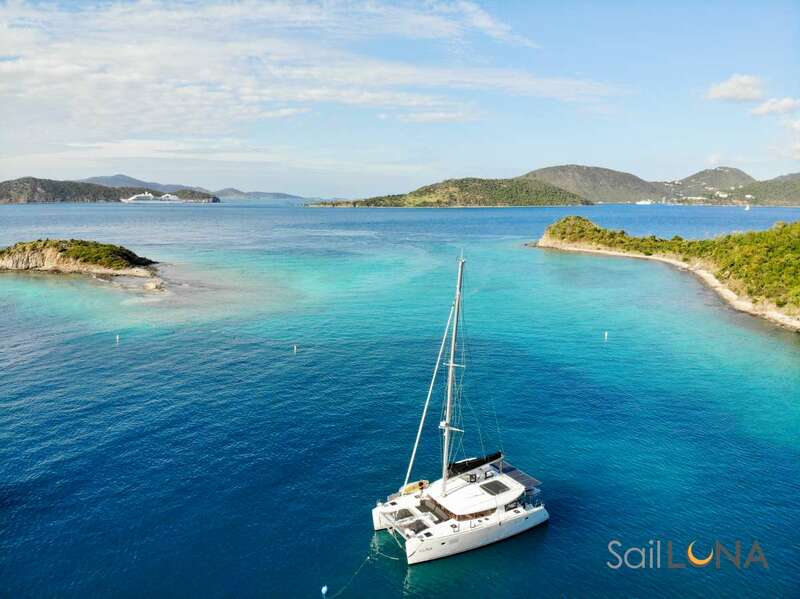 She has been sailing in the British Virgin Islands since 1999 and has taken several ASA sailing courses over the years both in Portland and the Caribbean. In 2012, Dianne felt it was time for a change and remembering her mom´s favorite saying a Turtle only moves forward by sticking out its neck, she decided It was time to live her dream. Dianne and Kelly sold almost everything they owned including their house and moved onto their 41 foot Catamaran S/V Mango. Dianne looks forward to dazzling guests with a cuisine that mixes Caribbean flavors with French techniques. Offer: Anniversary special: $500 off for Honeymoon and Anniversary charters. Family Discount: Children $125 discount per child 12 and under. Send us an inquiry to get specific pricing for Mango. I Forgot What Day of the Week it Was! Kelly and Diane were so friendly and accommodating, from the first offer of a Pain Killer when we boarded early to timing the walk through customs between rain squalls at the end. The boat was amazingly clean that we could have eaten off the deck :) We tried the AC the first night and then decided we missed the ocean air to much so just opened the hatches for the rest of the week. don’t eat this good when at home in fancy restaurants. We had a vegetarian among our group and everything was delicious for all. The trip beat our expectations. The trip out to Anegada was smooth and so glad we opted for a cat. Snorkeling at the Indians was stunning. Everyday was special and felt exclusive with Captain Kelly and Dianne getting us to the right places early yet at a relaxed pace. I forgot what day of the week it was, haven’t done that in a decade. It was such an awesome trip. We had the best vacation ever on Mango with Kelly and Dianne. The Islands were beautiful. The snorkeling was awesome. The food was delicious and the boat was a great experience. Kelly and Dianne were great hosts and are now friends. This was a whole new experience for us. We all had a great time on our trip. Diane and Kelly did a great job. Food: All the food was outstanding. We had breakfast, lunch and dinner on the boat for 8 days. The preference list we sent prior to the trip was very specific. Our daughter Brooker has food allergies and they addressed them at every meal. I dont eat red meat and the times beef was served, I had a great chicken dish. We are very picky healthy eaters and this vacation was our best eating experience ever on vacation which includes Napa, Europe, etc. It couldnt have been better. How Diane was able to cook such great meals in such a small kitchen is amazing. Moorings: My wife Kelly and I had sailed 2 other times for 7 days each leaving from the Moorings in the BVIs. We moored at 2 places on St. John that wed not been to before that were beautiful with great snorkeling. Wed been to the places we moored in the BVIs before but they chose the best and also knew of other places to snorkel that we werent aware of that were great. Our sailing experience was perfect. The places from day to day were very different and even though Kelly and I had done this twice before, it was spectacular as always. We basically jointly planned the itinerary at the beginning of the trip and adjusted based on the weather and sea conditions. Overall: It was truly a great experience in which we were pampered throughout with great food, views, snorkeling etc. Our 2 adult children had a blast and wed all do it again in a heartbeat. I am so glad that a spot came open. Kelly and Diane were extremely friendly and invited us in to their home like we were family. Diane made incredible dishes - we are not at all used to eating that well! This adventure is considered by everyone in our party to be the best vacation ever. What a way to kick off a honeymoon! The short version: This was an amazingly unforgettable experience that we would not hesitate to do again! We could not have asked for a nicer and friendlier crew, better food or a cuter vessel. A+ experience overall! The all-inclusive package was awesome, so we didn´t have to worry about mooring fees, fuel, beverages, etc. The hardest decision we had to make all week was what we felt like drinking and if we wanted to snorkel or just sit in the sun. Thank you, Dianne and Kelly, for being such great hostesses and new friends!!! The long version: From the moment Kelly picked us up in Red Hook and delivered us to Mango, where Dianne was waiting, to the time we got off in Tortola, we were so spoiled. Our 4-night itinerary included stops at Jost Van Dyke, Sandy Cay, Virgin Gorda, Marina Cay, Cooper Island and Norman Island. It was the perfect balance of seeing the sights every visitor wants to see when they come to BVI, like the Baths, and seeing other more out-of-the-way spots that honestly we´d never even heard of before we got there. So glad we gave them full control of our itinerary, because these ladies truly know their stuff. No matter where we explored or were moored for the night, they had suggestions to keep us entertained and happy... but there was plenty of quiet time for chilling and relaxing when we wanted it. Our favorite stops: Sandy Cay for the beautiful white beach and easy, pretty hiking. Cooper Island for the rum rum rum rum, and there is truly nothing like the Baths. On a typical day, we would get up, eat breakfast, snorkel a bit, then take off for a destination to explore. Then we´d head to where we would moor for the night. Mango itself is a really beautiful sailing vessel, and it never felt cramped. It is very well cared for, and decorated so cute! It is perfect for one couple plus crew, and if everyone´s very good buddies then maaaayyybe even two couples! :) Your days will start early with the sunrise (who wants to miss a moment of daylight in such a gorgeous place?!) and, if you´re anything like us, you´ll be ready to kick back on the trampoline and enjoy a few drinks before an early bedtime. We learned that the ´sailor´s midnight´ is around 9:30 p.m. Being a catamaran, the boat feels very level and secure all the time, so if like us this is your first trip like this, fear not. -All the great snorkeling... can´t say enough what gorgeous underwater landscapes we were able to see! And no darn jellyfish will spoil those memories. There was no point where Captain Kelly and First Mate/Chef Dianne didn´t go above and beyond... they even helped us pick out the best spots for our second leg of the trip, when we stayed on Tortola. Arriving home to a nice folder of great photos they took for us was such a nice way to remember everything. If it´s ever feasible to take a second honeymoon (hey why not?) then we´ll see you again, Mango! Spoiled Rotten by the Mango Crew! First let us just say WOW! This trip was beyond spectacular!! Being the first time on an overnight sail charter we were a little apprehensive. Within the first hour we were like this is amazing. By the afternoon of day two we were jello and by day four we were so relaxed and had so much fun we didnt want to leave this beautiful Catamaran or the wonderful crew. Throughout the duration of the trip the crew go out of their way to make sure you are taken care of.drinks, tunes, quiet conversation, food, games - just a totally relaxing time as they take you through the waters, to the snorkeling spots, and drop you for a land excursion of rum hunting. But beyond the beautiful boat, sea and sky the biggest standout for me was the food. The creative genius they come up with on a boat is insane and I am a well-traveled foodie. Biggest standouts for us were the Steak Pizza (filet mignon and caramelized onions)and the Shrimp Scampi (good sized shrimp, butter, and garlic)pure heavenly goodness. We sailed for three nights and four days and our only complaint is that the trip was too short. Kelly and Dianne are professional, take a personal interest in your joy, and make sure your meals and itinerary are based upon your personal choices. This is a must do for anyone who really wants to see the beauty of the USVIs and/or BVIs! Our 3 night/4 day charter has been amazing, you ladies have showed us a side to nature we dont get to see very often. We have loved our adventure with you so much. Our favorite day had to be swimming with the petting zoo. The turtles, octopus, southern rays, spotted eagle rays, and fish were unbelievable. It was like they all came out to say hello! A day we wont forget. Oh and the barracuda under the boat and all the squid too. Such an adventure. No review would be complete without a rave review to Dianne. Our personal chef from the school of Le Cordon Bleu is the best we have ever had. I cant even tell you my favorite dish, they all ranked at the top. The shrimp scampi, the cheese plate with pears and the delish ginger pancakes. So wonderful. You ladies treated us like family. Thank you from the bottom of our hearts. An incredible journey.We cant wait to do it again in the BVIs! Thank you so much for a wonderful experience aboard Mango. You truly helped make our honeymoon the trip of a lifetime. We want you to know what a wonderful trip we had. You two went out of your way to make sure we had a good time. It was so nice to be in the hands of such good sailors. We wish you all the best! Thank you for making this a vacation of a lifetime. Great Sailing, Great Food, Great FunA Completely Catered Vacation! Captain Kelly and First Mate/Chef Dianne provided amazing accommodations and company! We sailed both the U.S and British Virgin Islands. The scenery, of course, is beautiful. But what made my adventure spectacular was the fact that they catered to my personal preferences. Prior to departure we spoke about my vegetarian diet and discussed things I like to see and do. From the moment I stepped on board, it was my dream vacation! I am a foodie and being vegetarian, I always expect to face some challenges. However, Chef Dianne is INCREDIBLE in the kitchen! Check out her resume! She made it look easy with her professional level skills, making every meal from scratch. Homemade cinnamon rolls for breakfast and pizza for dinner...on a boat?! Who does that?! It didn´t stop there. From Indian to Caribbean, the varied cuisine on board was awesome! It was pretty much gourmet dining the entire trip! Her spin on vegetarian meals far exceeded my taste buds´ expectations! Oh ya, the sailing and snorkeling! Captain Kelly knew the perfect spots. Every sail was a fun adventure and each bay was filled with exciting sights. Both Kelly and Dianne are just a joy to be around and with a great sense of humor, we really had such an enjoyable time. I´ve already booked my next charter with them! I was a bit hesitant about booking with a small charter, but now I wouldn´t travel the Caribbean any other way. The trip on Mango with Captain Kelly and Chef/First mate Dianne was incredible. Our family booked all three cabins For a 9 day USVI/BVI trip.The boat--is great! We loved just hanging out on the ´trampoline´ out front whether sailing or not.The food was amazing! Having been on ´catered´ day sails where everything was packaged food, this really blew us away. Freshly made scones and cakes; sea-fresh fish tacos with homemade mango salsa. Great coffee (we´re from Seattle, after all), and even better pain killers in the evening. Because they live there and love the islands, the crew on Mango knows the best, and most uncrowded places to snorkel. There were many times when we could snorkel and not see anyone else (unlike those huge charters where you jump in with 150ish other folks). Captain Kelly really knows her fish, and the island history. It was great for us to learn so much. They even dropped us off one day to walk up to an old sugar/rum factory. This is a perfect family trip--and the next time we were aboard, we left the kids at home and went back as a couple! Great for that too.